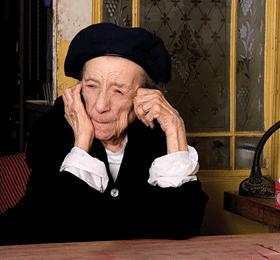 Bourgeois was born in Paris in 1911 and has lived in New York since 1938. Her prolific career has spanned, and in many ways presaged, several artistic movements, as her body of work engages the symbolic and the psychological, often incorporating subject matter related to female identity and the oppositions that it entails (male/female, mother/father, organic/geometric). 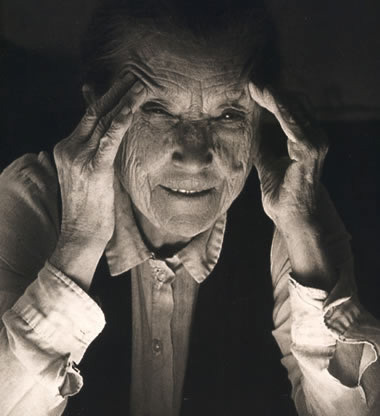 Bourgeois’s rich and vibrant oeuvre can be credited to her sustained exploration of recurring themes—home, family, motherhood, sexuality—and the consistently rebellious originality with which she pursues new imagery. 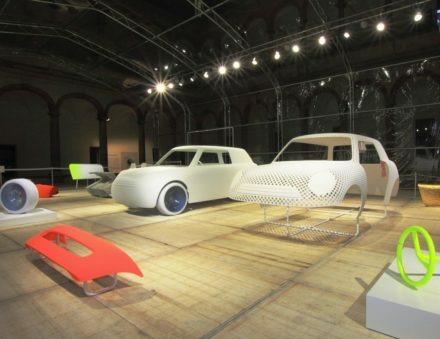 Cell (1990–93) is inhabited with glass bubbles that sit atop roughly made chairs. 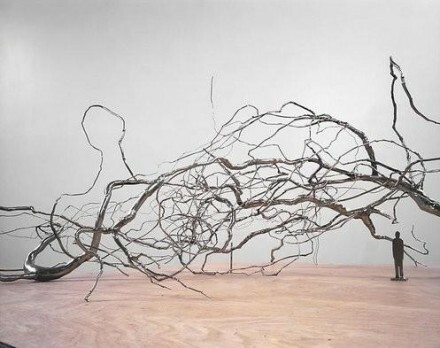 Their contained form implies alienation and a denial of communication, while their fragility and close placement suggests a frustrated but silent communion. On an adjacent table, a pair of marble hands is clasped in despair. 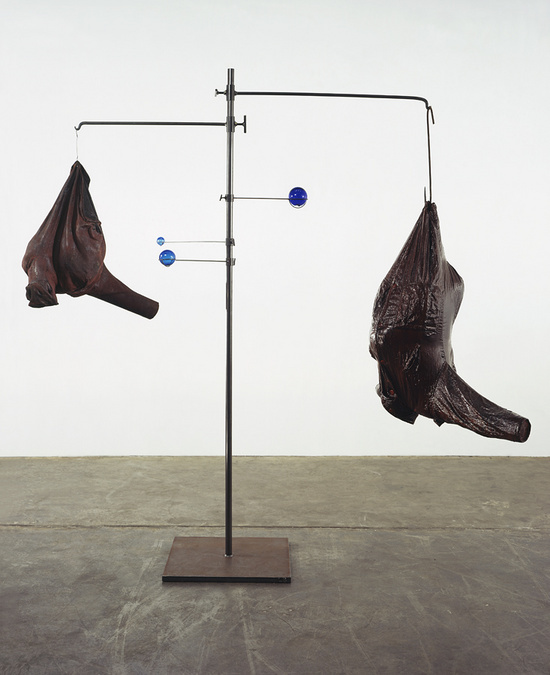 Echo (2007), a suite of seven bronze sculptures, is cast from Bourgeois’ discarded clothes that have been draped, stretched and sewn together. Alternately slender or slumped with bulbous folds and creases, they represent maternal feelings of nurturing warmth and organic growth. As their title suggests, they, too, are redolent of reverberations from the past. 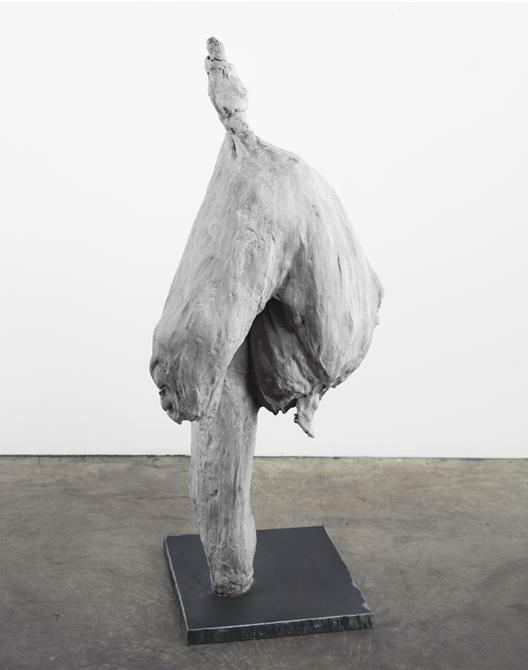 Cast from discarded clothing that Bourgeois has variously stretched, sewn, draped and piled into abstract, organic forms, the bronzes are then painted white to give a ghostly aura to the textured surfaces. 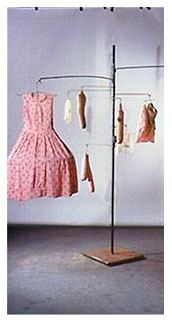 Bourgeois began using her clothing as material for her art in the mid-1990s. The re-appropriation of her wardrobe and linens conjures the fraught territory of domesticity and familial hierarchies, but does so in the most personal of terms. Ever present in Bourgeois’s work, inherent contradictions make the sculptures resistant to any easy interpretation—they are at once soft and hard, cold and warm, nurturing and distant—and thus perpetually worth viewing. 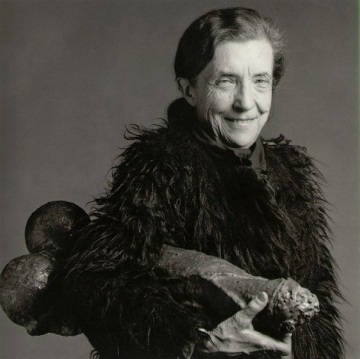 “Cell (Glass Spheres and Hands)” is one of several freestanding sculptural installations by Louise Bourgeois. 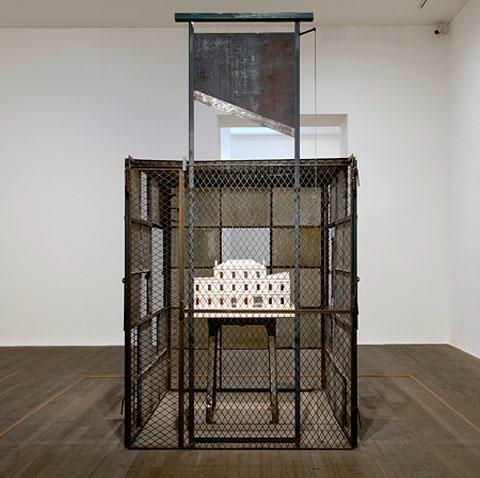 The title “Cell” can refer to the most basic building block of a living organism or a prison. 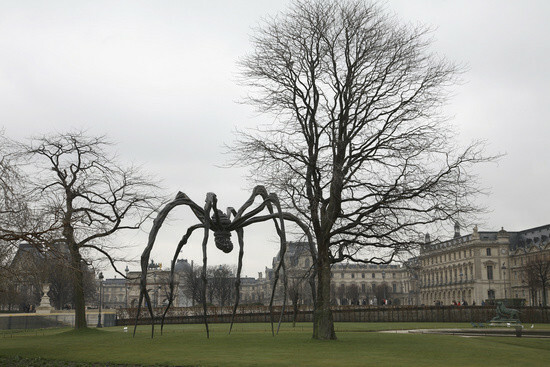 Bourgeois’ Cells combine aspects of both definitions, pairing the organic with the correctional. 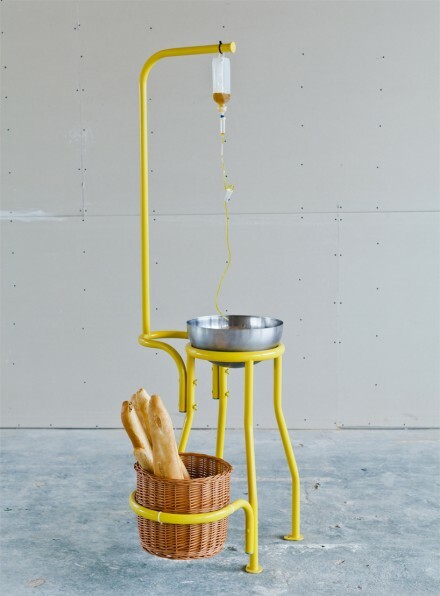 Matching used perfume bottles, vanity mirrors, model homes, and excised limbs with steel fencing, broken furniture, a guillotine, and a mechanical saw, each composition employs domestic and institutional elements to tell a story. 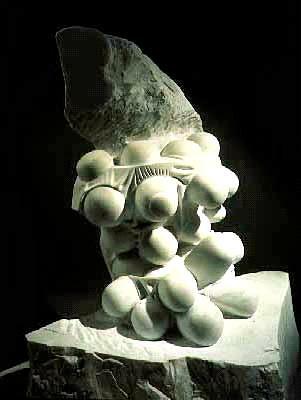 In “Cell (Glass Spheres and Hands),” two fragmented marble arms rest on a fabric covered table. 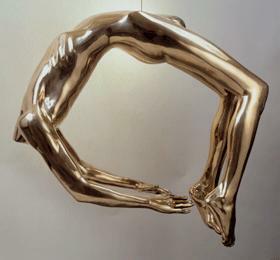 With hands clasped in a gesture of prayer, the isolated arms appear to be soft and vulnerable in spite of their rock-hard substance. 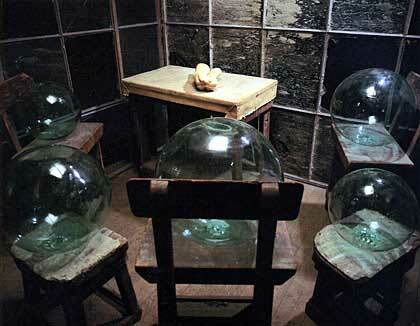 Encircling the table are five glass spheres of different sizes, each resting on its own worn chair. Each enclosed sphere is like a bubble, self-contained but fragile in its existence. 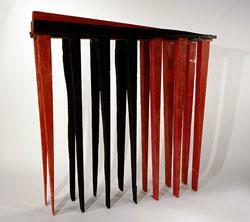 The chairs and spheres face the table in a united front, cornering and further isolating the hands. 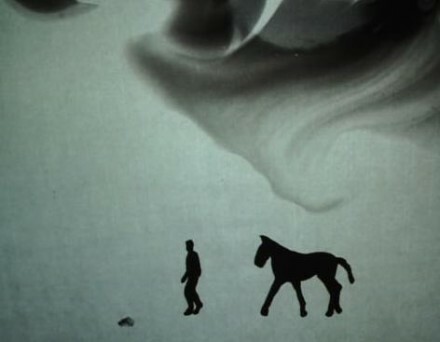 The work plays with relationships such as teacher/student and parent/child. 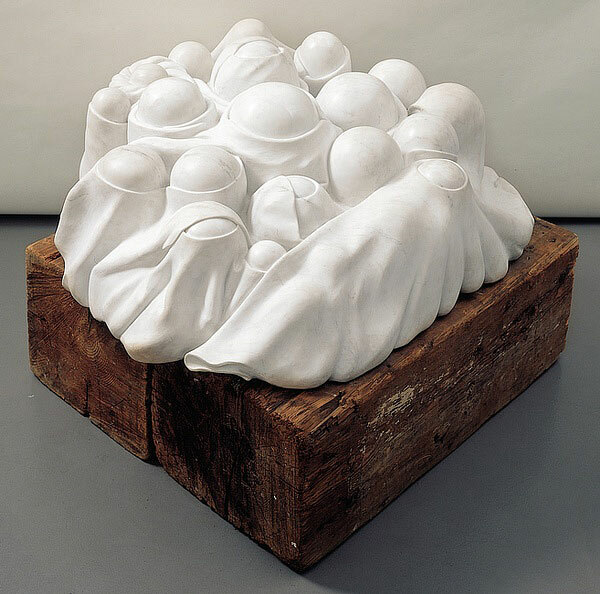 In an arrangement that is reminiscent of a family gathering or classroom situation, “Cell (Glass Spheres and Hands)” invests inanimate objects with human qualities by enacting a drama in space. Allusive and open to interpretation, Bourgeois’ “Cells” are places for uneasy contemplation. 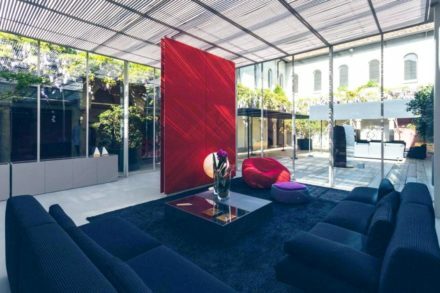 The steel and glass walls enclosing each work protect the objects inside, but also restrict them from ever escaping. Like a prison, the caged walls enforce a rigid form of solitude while offering only partial views of the outside world. In “Cell (Glass Spheres and Hands),” glass panels obscure the objects within, forcing viewers to peer through a grid of spaces where a window has been knocked out or shattered. 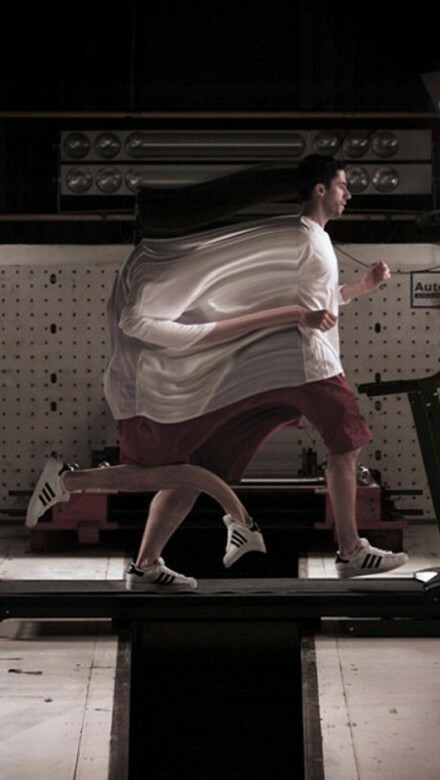 A tension is established between the desire to look into the freestanding room and the real possibility of hurting oneself on a glass shard while doing so. To these may be added an acceptance of luck and fate, and (as she looks back over her life) a desire to explore and confirm her identity as mother, daughter, and wife. When Bourgeois began working on this series in late summer 2007, her first works tended towards the graphic, with clean lines and more empty space; but as she found her subject the works became gradually more painterly and gestural. 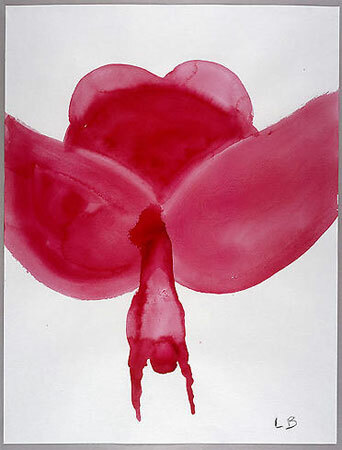 Working ‘wet on wet’ – that is, allowing new applications of gouache to soak into old ones; Bourgeois allows a certain amount of chance to affect the outcome of each work. 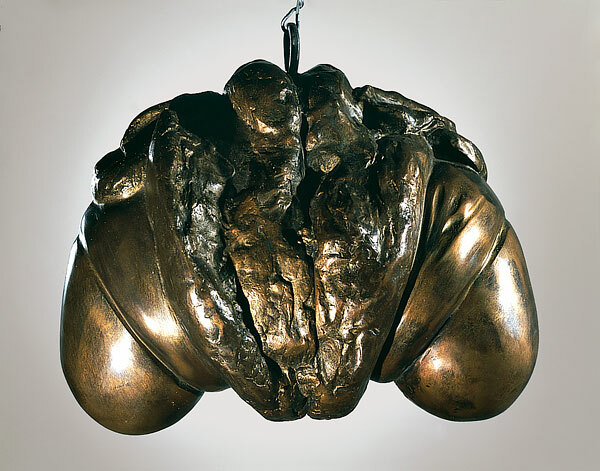 The recurring images of the various stages of parturition and breastfeeding reveal the centrality of motherhood to Bourgeois’ conception of herself and reflect a desire to remain connected. 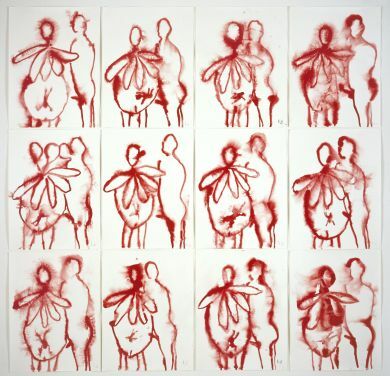 The Couple (2007), a series of 18 bright red gouache drawings, depict stylised and ambiguous couplings, with figures that smudge and bleed in an arresting visual metaphor for the blurred lines between self and other in the struggles for an intimate, sustained and fertile relationship. Opposites are also at play within Bourgeois’s gouaches. 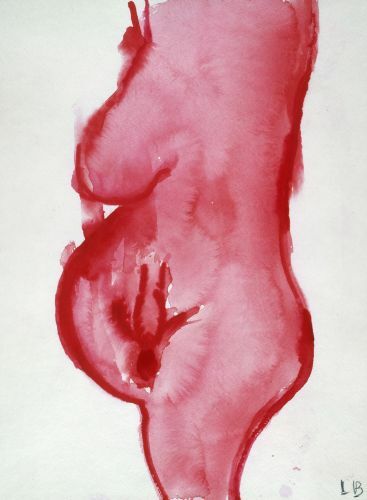 Again dating from 2007, the paintings depict the processes of motherhood, from conception and pregnancy to birth and beyond. 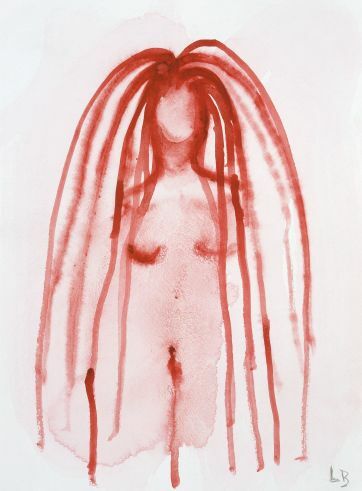 Bourgeois’s blood red paint is at once bodily and ethereal—the paint, applied “wet-on-wet,” was allowed to bleed and coalesce, leaving a range of organic, accidental marks that complement the corporeal nature of the imagery. 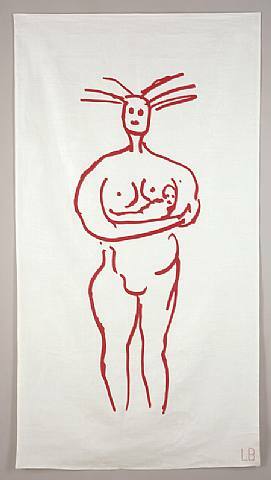 The intimacy of family and the primal connection between mother and child have long provided Bourgeois with fertile subject matter. 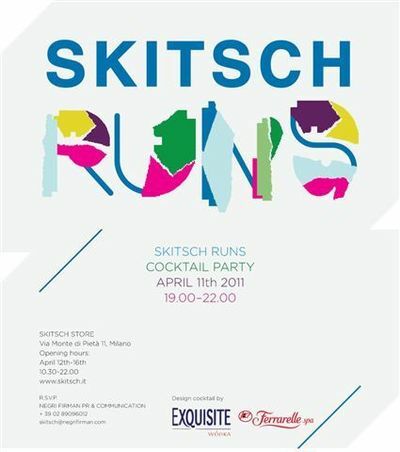 Recent years have seen a shift in the artist’s motivational concerns away from her father and towards her mother. As a young girl she nursed her mother when afflicted with the Spanish flu; now that she is old and frail and dependent on others, Bourgeois herself feels in need of a mother to take care of her. 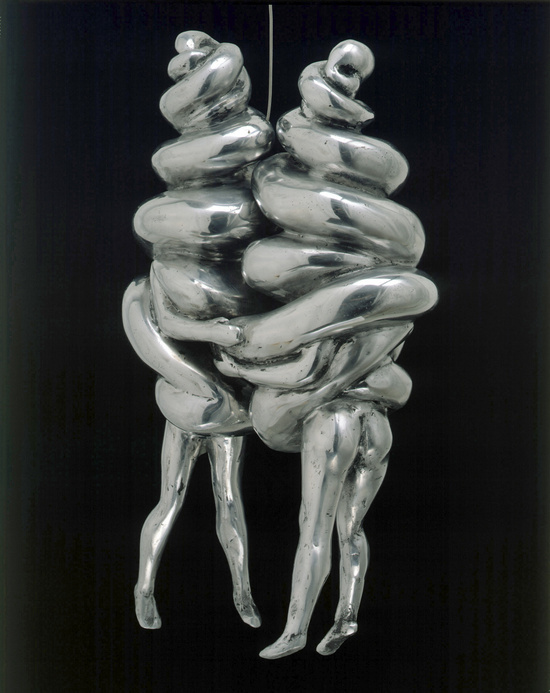 Shuttling (in these works) between the roles of mother and daughter, Bourgeois recovers the profound identification of the one with the other based on the shared capacity for motherhood, so that, as Louise has said; ‘they shall not be separated again’. 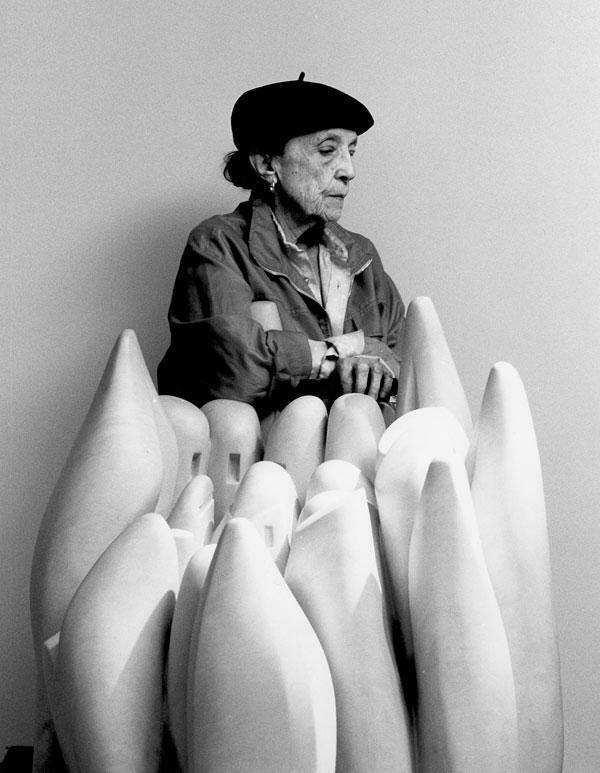 Louise Bourgeois was born in Paris in 1911, and studied at the École du Louvre and in the private atelier of Fernand Léger. 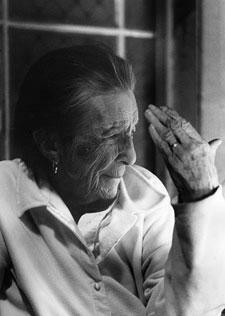 In 1938 she married the American art historian Robert Goldwater and moved to New York. 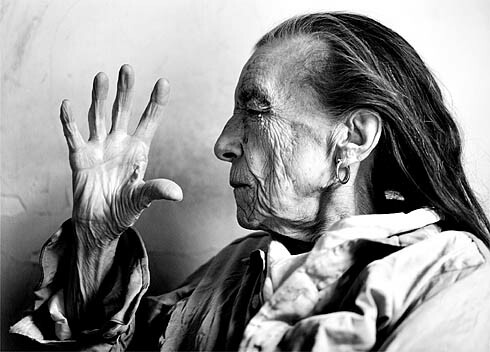 She became an American citizen in 1955. 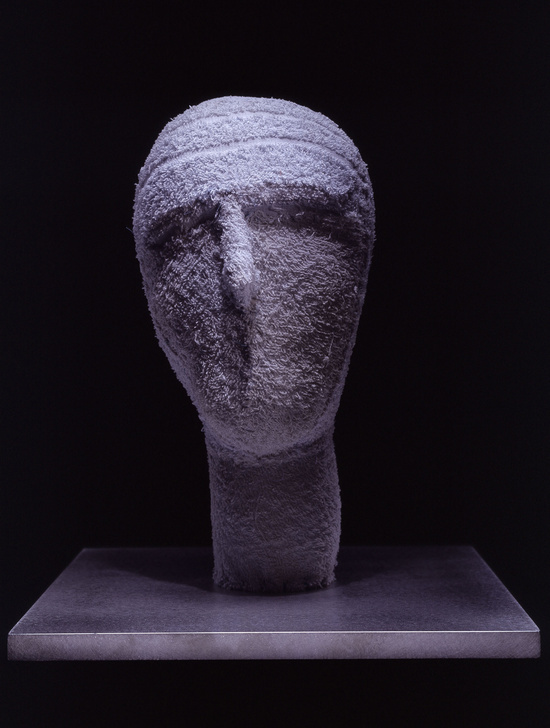 A landmark retrospective at MoMA in New York in 1982 brought her widespread recognition, and since then her work has been assessed and celebrated in major venues all over the world. 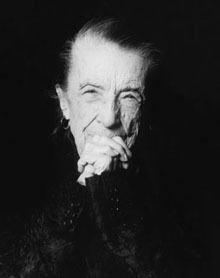 In 2007 a large-scale retrospective was inaugurated at the Tate Modern in London: then travelling to the Centre Pompidou in Paris, the Guggenheim Museum in New York; the Museum of contemporary Art in Los Angeles and the Hirschorn Museum in Washington, D.C.
Louise Bourgeois lives and works in New York City. 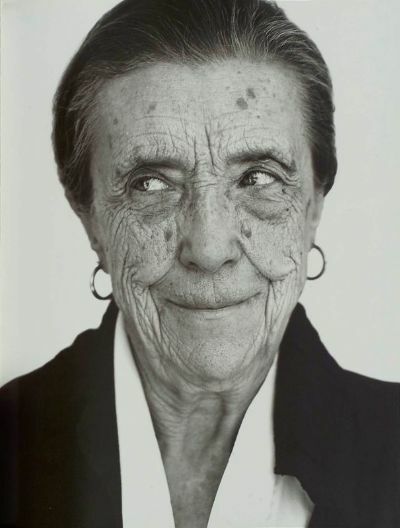 Louise Bourgeois, the French-born American artist who gained fame only late in a long career, when her psychologically charged abstract sculptures, drawings and prints had a galvanizing effect on younger artists, particularly women, died on Monday May 31st, 2009 at the Beth Israel Medical Center in Manhattan. In his multifaceted work, Toronto based painter, photographer, performance and video installation artist Kent Monkman deals a table-turning hand on the one-sided histories of Euro-American descent. 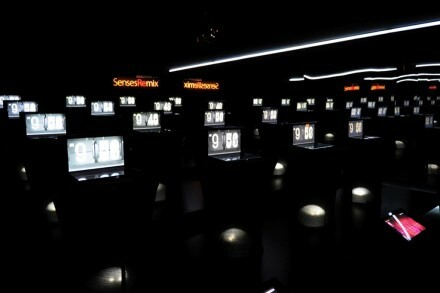 Rapt Studio debuts at Salone del Mobile with Tell Me More, an interactive, immersive installation at Ventura Centrale. 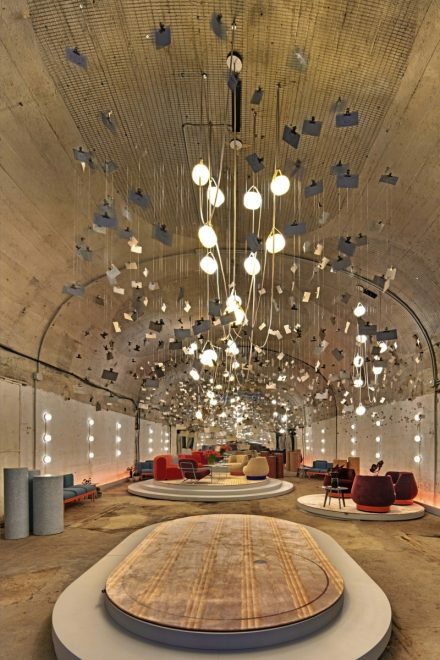 Tell Me More explores the intersection of spatial experience and emotional connection, offering visitors the opportunity to experience a microcosm of a Rapt-designed environment.